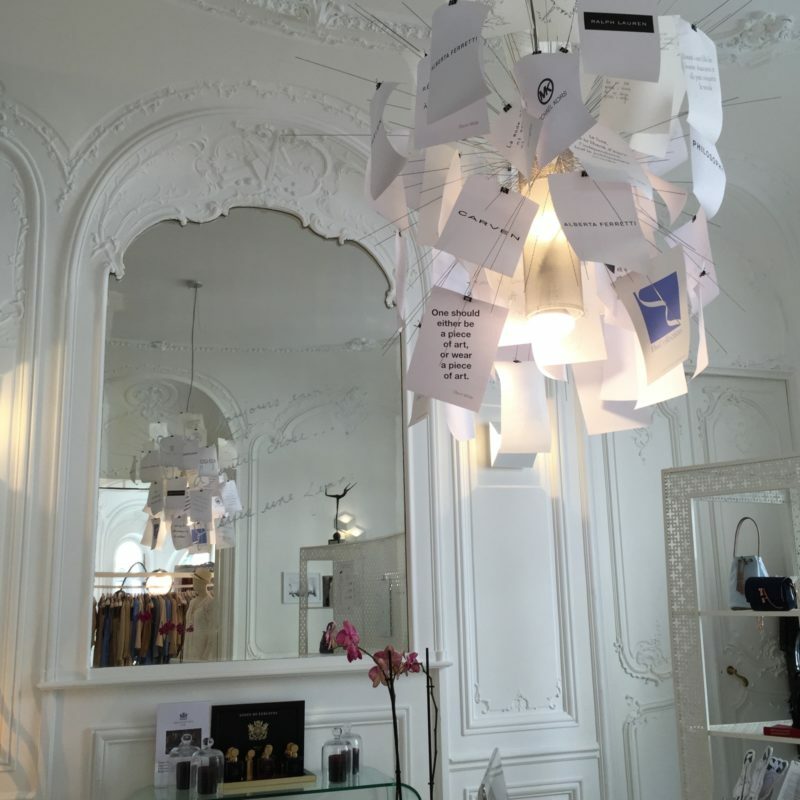 We launched the concept of Elss Collection and moved here to the concept store on Beaujon Street, two years ago. Our concept focuses on renting seasonal collections belonging to top luxury brands. No one else does that in France. Our key concept revolves around the notion that clothes are goods which don’t have to be purchased, given fashion’s constant evolution and our own needs as women too. We have desires; we are really interested in what is displayed during shows, in shops, etc. And last of all, it is a bit of a shame to invest in an outfit which will later on lose its appeal, since we would like to try something else…And unfortunately, no one has an unlimited budget. So I thought it would be a good idea to create a large dressing room which would continuously change with the latest luxury brand collections, of current seasons. What we provide are collections which are available in stores at the moment, which have been displayed during the latest shows. We work with luxury brands to be able to select what we want from their collections, what is adapted to our clients. We provide a well-stocked dressing room as far as women’s needs are concerned; it caters to the needs of urban dwellers; working women; women who need outfits for parties, get-togethers at a friend’s place or dinners as well as those are professionally active, who attend conferences, seminars where they need to make a strong impression. We also have really smart outfits for galas, weddings, family gatherings, etc. We provide two services: outfit rentals for special occasions and an unlimited subscription which provides access to our entire collection and permits a change of outfit at any time of the client’s choosing, even on a daily basis. There is also a third option – because women love to indulge – which permits them to buy any item they like either at the end of the season at highly competitive prices or brand new during the season as well. However, we are not a traditional retail outlet. We wanted to create an experience for our clients; to find a highly exclusive, almost hidden, secret, venue. Clients feel relaxed when they come here. They don’t expect to be in a salon like this. There is an extraordinary serenity which contrasts with life’s stress. We also provide several services. We take care of women. For example we have stylists who provide them with advice. We operate through our concept store as well as our website. It is our aim to become Europe’s leading clothing rental service. There is certainly a market for it even though it’s slightly behind compared to the USA, and it’s certainly going to grow significantly within the next 5 to 10 years. Business women would certainly be attracted to such an idea. Yes. But you have to find the right method of attracting them, and I believe we have found an attractive one with our €150 monthly subscription which also includes dry-cleaning services. The subscription permits them to rent two items at the same time and change them when they want to. It is an attractive option. It is completely affordable and ensures they can save money. Clients who opt for it don’t have to do any laundry; they can come at any time of their choosing: it’s flexible. And even if they don’t have the time to come, they can always keep their two items and get to make use of them. On the other hand, they can also make changes on a daily basis if it suits them. For single item rentals, for example, a really beautiful dress worth several hundred or even several thousand euros in a boutique would cost between €120 to 130 to rent. We open every day, including weekends, on Saturdays. It is also possible for clients to make reservations on our website in case they don’t have the time to come in and to also have those items delivered. We however do not rent out accessories; we sell them: popular small accessories such as bags, clutches, scarves and wraps. It is also beneficial to women spending just a few days in Paris who have to attend an impromptu event… they can come and rent something from you. Exactly. We also work in partnership with 5 star hotels: concierges are aware of our services. Among other things, it can be interesting when someone has lost their suitcase! How many brands do you work with? 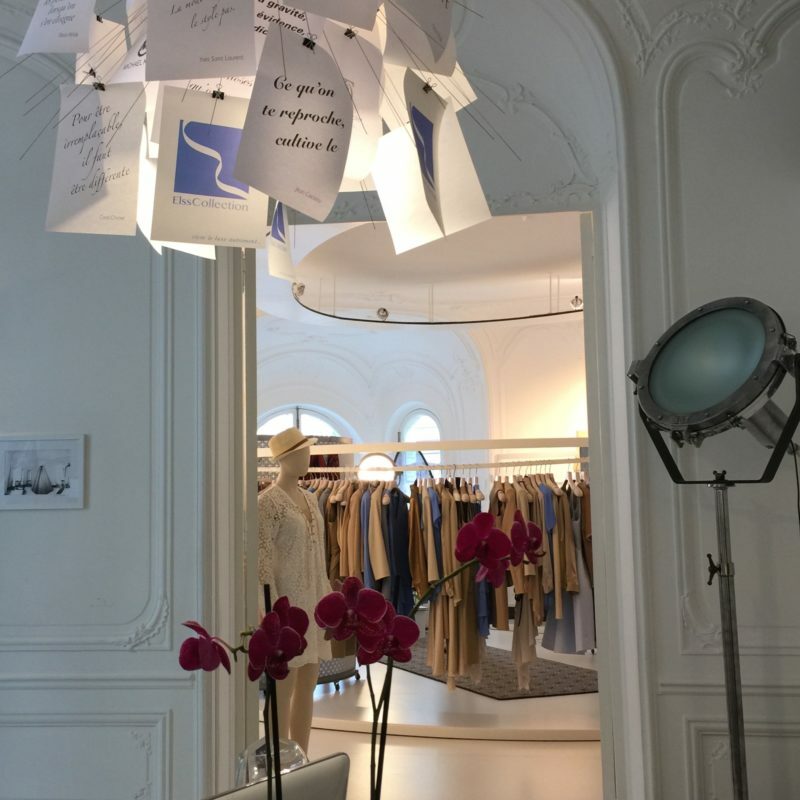 About ten French, American and Italian brands such as Carven, Kenzo, Ralph Lauren, Mickael Kors, Alberta Ferretti,… brands which are highly fashionable, with a global influence. 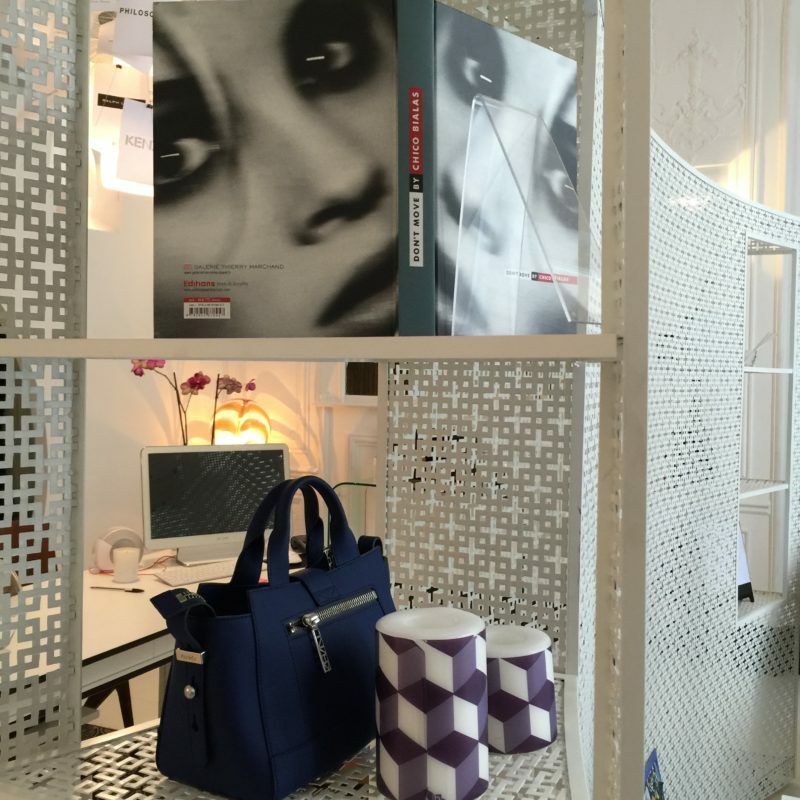 There are also American brands such as Halston and Milly which are really popular in the United States but less so in France for whom we own exclusive distribution rights in France: they are highly suitable for our clientele. Our clients really enjoy being able to access beautiful brands and discover them with our help. Certain brands also provide them with the assurance of being uniquely dressed in the whole of France. Did you choose American brands because you found them more accepting of your idea? We selected them because we shared a common vision and were compatible. We found we were compatible when we met with them. We enjoy working with brands which support our concept, which provide us with assistance. We assist each other mutually: we distribute their items and represent them while they support us in return. We communicate a great deal on our brands. Our clients enjoy discovering what is behind them, their stories, the effort, and the collections. They are interested in knowing what inspired them and who their designers are. We adhere to the standards of luxury even though our concept is unusual and innovative. It is our aim to explain luxury through alternative means to our clients, to enable them to experience it alternatively, rather than change it completely. Were you well received by the big names? Yes, however we ensured we were well prepared when we met with them! We found they were already familiar with the concept of renting since it was already well developed in the United States. We explained that it was what their clients expected and that their traditional distribution channels resulted in a slight loss of contact with French clients. 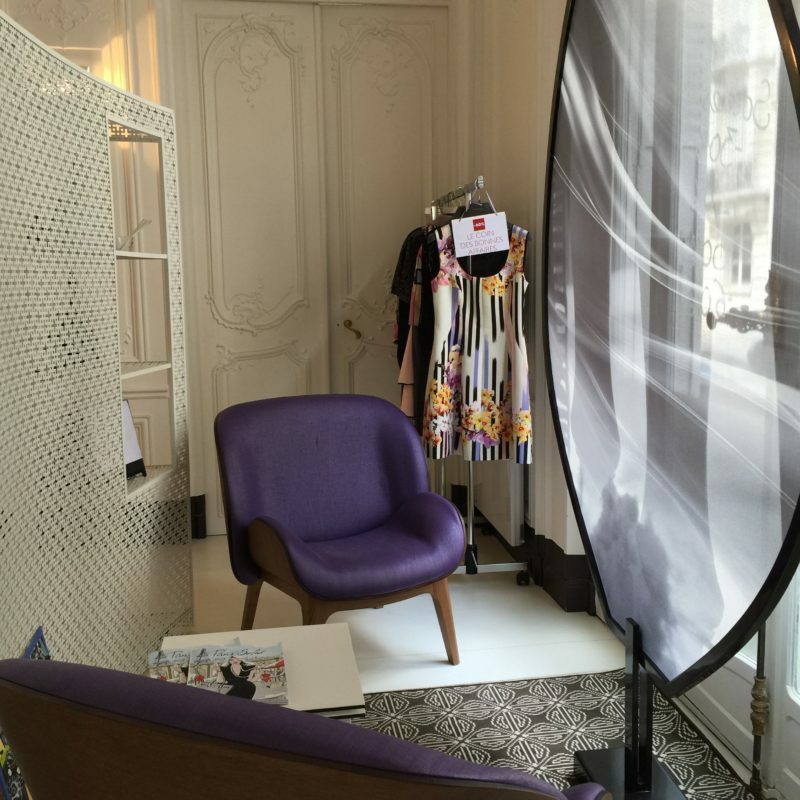 Today, luxury brands operating in Paris cater especially to international clients. Those in Paris do not frequent Montaigne Avenue; few of them shop in retail outlets belonging to the leading luxury brands. Is your clientele made up of mostly French women? Not solely, we also have tourists who appreciate the exclusive experience we provide them. Our concept also provides brands with the opportunity to connect with French clientele. Our ability to function as a qualitative sales outlet, to provide a suitable environment is what matters to brands. We also assured them that attention would be paid to the brand mix and that we were capable of operating and communicating effectively as a team which possessed extensive experience in the luxury industry. The quality of the address and the space as well are of key importance even though we are quite different from a luxury retail outlet. We are slightly more light-hearted. 95% luxury with 5% creativity, uniqueness, innovation which show that we gently disrupt the codes of luxury. What is your opinion of the movements which can be observed in new luxury business models? Brands create four collections annually with a significant time frame between their presentation and their availability in stores which in my opinion, is not very modern. I don’t understand why a waiting period of eight months is necessary for a collection. Clearly they need to be produced. From the moment brands operate on a wholesale basis, there is however a somewhat unalterable timeframe for getting from shows to stores. It could also be possible to schedule the date of the show so that it occurs just before the items arrive in stores, and that is what certain brands have begun to do. I find the lead time between placing an order and its arrival in stores to be quite lengthy. And even though I am obliged to make do with it, it is quite an inconvenience. When a new need is observed in the market, reacting promptly becomes difficult. We recently decided to change the sizes we provide. We will have to wait a year to be able to implement it! So it’s true that strategic movements in our business take time, it is like an ocean liner: getting it to turn around quickly is impossible! At some point, the entire fashion sector will re-examine itself. Your concept is already calling certain things into question. Yes. For example shops traditionally take delivery of their winter stock from the month of June. Winter in the month of June! But no one wants to experience winter in June, everyone wants to wear summer outfits. We cannot accept winter collections the same way stores do since we rent clothes out: our needs are immediate. Clients who come here want to wear an outfit right away. As a result, brands are obliged to adapt to our cycle in terms of delivery schedules. Is it your intention to develop using the same model? It is in France that the development will initially occur. There is also an interest in it in Europe. Today, the notion of renting clothes no longer surprises anyone. It’s actually rather a trend. A modern means of consumption. Possession is actually no longer trendy nowadays. What we wanted from the outset, was to have a balance between online and offline, where one completed the other. Physical presence is essential. Everything online enables the multiplication of growth by touching every area. However being physically present is really important for establishing our positioning which clearly lies in the domains of luxury and service. It is really the experience. So the idea is making incursions into different European countries, initially with our website before creating concept stores. It is somewhat the reverse of what was done in France. 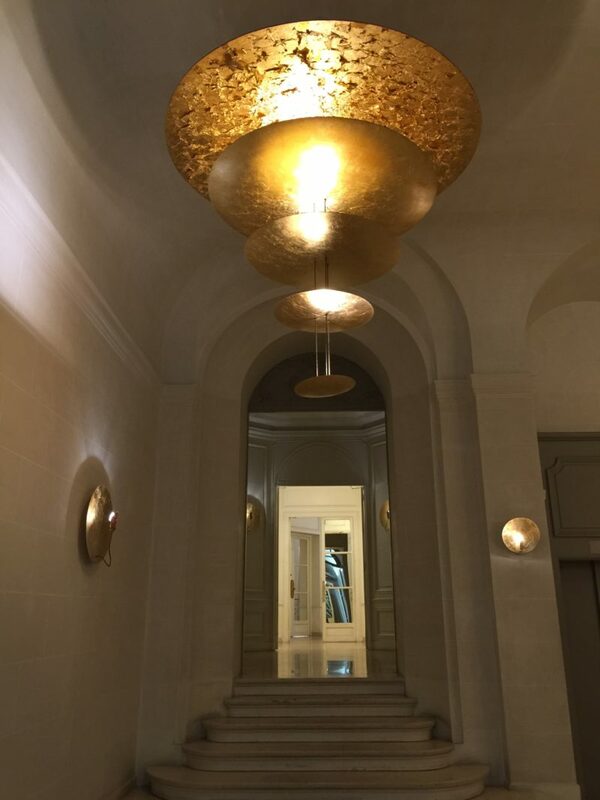 Yet a place like this, which is quite close to the Champs Élysées in a prestigious building clearly costs quite a lot. It’s our flagship store. The place you occupy is an exceptional one. It is a breath of fresh air compared to the hustle and bustle outside. Yes. Everything is white. There’s a sofa shaped like a cloud. There are moving cubicles which are never in the same place. There are rolling objects which create space for events, which we organise in quite a large number here for our community, our partners and our clients. We hold one every week. Our concept actually involves a lot more than renting out outfits: we are attempting to build a community which brings people together. We are creating ties. We organise exhibitions; we hold book signings; we organise beauty parties, style parties with fashion consultants, workshops. We are engaged in several different activities. And we occasionally have fashion shows. During the EURO – one evening when France’s team was playing – we had a party for ladies who were not fans of football. It was a completely girly party with sweets and manicures. It was completely regressive: 80 people attended. Everyone had loads of fun. We took photographs and really had a great time. The previous week, we had a book signing by an American journalist who wrote a book on perfume. Because we find that perfume and fashion go hand in hand. Being creative and providing innovative offerings on a constant basis is necessary since getting people to come is no easy task. I think it is definitely worse in New York but here in Paris, people are stressed out and completely overwhelmed. They don’t have the time for anything. The circumstances in large cities are somewhat similar. So we have to get people interested in order to get them to come and hang out with us for a short while. We have to provide attractive offerings which make life easier for them and enable them to save time. So we provide home deliveries and provide alterations. Your services certainly make life easier for busy women. It is a lifestyle you are well acquainted with. Let us talk a bit about your career. You have actually innovated in a domain which was, basically, not your own. You came from the consulting sector didn’t you? Yes. I was a strategy consultant specializing in energy. My clients were rather large energy companies since we have several of them in France: EDF, Engie, Areva. It was quite a significant change because I changed my role from a consultant to the business leader of a start-up. I became the owner of a ‘start-up’. I also had to change sectors. So the change was a rather huge one! What was your motivation for becoming an entrepreneur? It was really a desire to build something concrete. Because when you are a consultant, you don’t go in-depth, to the level where things are implemented. You remain at a conceptual, strategic level. It is really interesting but I really wanted to do something. That was it. And besides, I also think that changing your life at a certain point isn’t a bad idea. Lots of people change their lives: they get divorced, go to the furthest ends of the earth. I however decided on a slight change of role and changed completely on a professional level. Really. And are you pleased with it? Oh yes I really am actually! I love the entire creative aspect of fashion related professions with stylists, photographers. I meet wonderful people every day and discover new professions. And then, there are purchases, collections: it’s really interesting. My profession is actually a multifaceted one. Last of all, communication is essential in my line of business. I didn’t know BtoC and I learned. Especially digital communication. It’s really fascinating! I told myself that I almost missed out on it! I feel as though I learn a lot every day on social networks, blogs. I am extremely interested in the entire process. I really love what I do and whenever I wake up in the mornings, I don’t feel as though I’m actually working. I find it really pleasurable every day. Was becoming an entrepreneur in fashion a deliberate choice? Not at all. No, it was a response to a need I identified, personally myself as a professional woman in charge of responsibilities. I needed to be well dressed for different professional events and felt slightly frustrated with the contents of my wardrobe. I decided that a service of this nature was required. I am often asked if I was a fan of fashion. No, not at all. Now, I like it a great deal, that’s certain. And the more you work with it, the more you actually appreciate it. I was supported by an incubator known as “Paris Pionnières”, an incubator for businesses created by women. It’s a very inspiring and motivating environment: it’s full of unbelievable start-ups and experts and coaches who support start-up owners. I didn’t have any mentor in particular, but I took the step of presenting my project to my network. Some people prefer not to speak to anyone about a project they are working on out of fear that someone else might steal their ideas. But it was the opposite for me. I needed to get feedback from the people around me and didn’t know anyone in the fashion industry. But gradually, I was introduced to people who could contribute, who had ideas, etc. And that was how I was able to gain access to luxury brands, meet brand general managers to evaluate their interest in my concept. And that was also how I met my partner Susan. Through my network. She had built an entire career in communication, in luxury, in New York’s large stores, Saks Fifth Avenue and Bergdorf Goodman. We began to work together before deciding to become partners. A third partner, who was more specialised in marketing joined us afterwards. Do you find having partners and working as a team, to be preferable? Yes, I have noticed a difference. At the beginning, I started the project all on my own. Even though I was supported by the incubator, I handled all my decisions on my own. One year later, my two partners joined and from then onwards I have been able to hold debates on important issues. We talk about everything together even though each of us has our own prerogatives, areas of expertise. We take decisions together. Where there is an effective group dynamic, having partners is really beneficial. How large is your current team? There are three partners and a team of eight individuals in total, although not all work full time. “The bulk of our team” handles communications, our website, events and clients of course. What major challenges have you experienced as a start-up owner? The same as any start-up: creating an awareness of the services you provide, managing to get new clients which is also a professional challenge. We are talking about innovation of usage. No one even thought that anything like clothes renting could exist two years ago. So I have to make myself known and be convincing at the same time. I have to convince everyone that renting outfits is a good idea. And that takes time! It’s something every start-up needs to be aware of: providing a good service or product is not enough. You need to plan on how to build your client base. And we explore new possibilities every day. The key is the strength of marketing. Is being the owner of a start-up more difficult as a woman? More difficult? No. What is difficult is the anxiety of not knowing whether something will work or not, of managing your finances, the fact that there is no opportunity to take a break from it all. But other than that I find being a start-up owner rewarding. I am quite passionate about it during conversations, at dinners and when I meet people. I enjoy talking about what I do and discussing it: I feel proud of it. Have you encountered any difficulties with raising funds? Did you start off using equity? Yes, I also took a bank loan, which is no easy task for a start-up. Now I endeavour to raise funds either through start-up funds, or Business Angels. But, at the same time, someone once said to me – and I love this phrase – “searching for clients is a thousand times more worthwhile than looking for investors!” So although I do look for investors, I dedicate most of my effort to searching for clients. You lead a busy life, do you find the means to breathe, to revitalise yourself? Is there anything you do in particular? I’m not an anxious person by nature. I can handle pressure effectively. My best means of revitalization are actually my friends. Like yesterday evening, we had a girls’ night out. It’s true you forget almost everything during such moments. You feel really light-hearted. I also have a group of friends I have known for over 30 years and we meet up as though we are still thirty years younger, to remember all that. And that is a good thing. Yes I have three children, three sons aged 20, 18 and 15. So I still need to really take care of them, even though they might object to it. Having a mother who is an entrepreneur must be rather nice. They do like the project as well as the business; they are actually interested in the business and help me out every day! Because we don’t have unlimited resources! So they often help out with the big parties we throw here and they really enjoy it. They are really well behaved. Pascale, you’re a Parisian. You have always lived in the city. What are your favourite spots? I love Quai Branly Museum. I find its works, the museum itself and the place particularly evocative. I can spend hours there! There’s also a restaurant on the roof with a terrace overlooking the Eiffel Tower. Experiencing the terrace when the weather’s nice, in the summer with the gleaming Eiffel Tower and the corner view of Paris is wonderful. It’s an amazing place! What is it you like about your city? Its quarried stone. When I close my eyes and I think of Paris I see this colour, and preferably see it warmed by the sun with the beautiful colour of the stone in the setting sun standing out. That colour is exceptional. And each time I tell myself that this stone is magical. It is a material of excellent quality that does not age. For me, it’s that: quarried stone and zinc as well. Paris’s zinc roofs. I am fortunate to live in a house in Paris, well, I live in a half-house, but I own the upper part of it and so I can climb on the roof. You’re not meant to but it’s made from zinc and sometimes you can sit on it with large cushions. The roof is flat: it isn’t dangerous. And we sunbathe with a view of all the other zinc roofs. I find it amazing! No other city is quite like it with those colours. It’s really very typical of Paris.